In his first full season at QAFL level, Broadbeach midfielder Blake Erickson has taken out the 2018 Grogan Medal. Erickson was awarded the maximum three votes in Cats victories in Rounds 1, 5 and 8. He went on to confirm his win with two votes in the final round to finish the season on 20, ahead of runner up Jason Burge from Palm Beach Currumbin who finished the season with 18 votes. A Nelson Bay junior, Erickson joined the Cats after spending the last three seasons with Southport’s NEAFL side. The 25 year old was a standout in the Cat’s engine room as the club climbed to their first top two finish since 2006. Burge (18 votes), bothers Brody (14 votes) and Cassidy (13 votes) Haberfield and Fowler (12 votes) rounded out the top five. In the QWAFL competition Tori Groves-Little and Brittany Gibson were awarded joint Best & Fairest honours, both finishing the season with 12 votes. It was Gibson who established an early lead in the vote tally, recording her 12 votes by Round 13. Groves-Little had a slower start but came home strong to tie for the QWAFL’s top accolade. 2018 was Groves-Little’s first season at Senior level, joining Coorparoo after playing junior football for Beenleigh. At just 17 years of age, she played in the All Stars and NAB AFLW Under 18 Exhibition matches this year. A natural leader, Gibson’s on field presence has been a defining factor in her success in both the AFLW and with Wilston Grange at QWAFL level. After starting her football career in Tasmania she will return there in 2019 to join North Melbourne’s AFLW side. Surman (11 votes), Gisu (9 votes) and Frederick-Traub (9 votes) rounded out the women’s top five. Brisbane girl and Wilston Grange defensive powerhouse Kate Lutkins was awarded the QWAFL Most Valuable Player Award, as voted by Coaches. 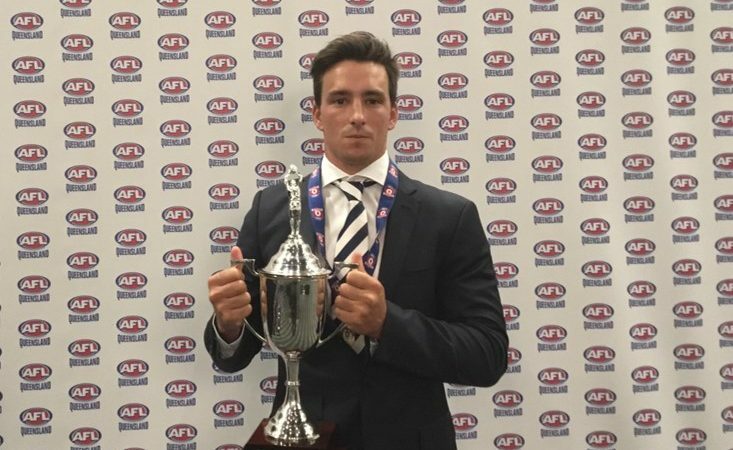 2016 QAFL Rising Star recipient Cassidy Haberfield from Surfers Paradise took out the 2018 Syd Guildford Trophy after catching the Coaches’ eyes in 12 of his 16 matches. The Syd Guildford Trophy is awarded to the QAFL most valued player, as voted by Coaches. Winners gallery can be found here. The QWAFL and QAFL Volunteer of the Year is awarded based on the following qualities; positive impact on their club, leadership and team work, mentoring and promoting a healthy culture that provides a fair, safe and inclusive environment. The QWAFL and QAFL Administrator of the Year is awarded to a club administrator who demonstrates positive impact on their club, leadership and team work, mentoring and promoting a healthy culture that provides a fair, safe and inclusive environment. The QWAFL MVP is awarded to the most valued players as voted by Coaches. The Syd Guildford Trophy if awarded to the QAFL Most Valued Player, as voted by Coaches’. The Keith Wallis Medal is awarded to the QAFL Colts Best & Fairest player. The Bill Clerke Medal is awarded to the QAFL Reserves Best & Fairest player.